I've browsed every single Extension on this site and on github, also used search bar this time. On example.com/settings I believe there should be an option to activate/de-activate dark theme. Through admin panel, yes it's possible but I believe users should have the freedom of doing this, locally. Is it possible? If so, how. Willing to test, follow, do anything to make this real. I do not believe its possible. Someone would need to modify the existing extension to allow it. 0E800 well the white theme (for me) is just beautiful as it is, but a friend of mine asked for a dark theme. Realised that there's an option in the admin panel but it's a global setting. Making user select it locally makes sense, if it's not possible, still okay. I love white one. Very well designed! I believe the easiest option is for a custom css to be added to the admin page so the style can be easily edited from the the admin panel without it being overwritten in updates. Generally speaking, dark themes fit one criteria to me - gaming. Minus gaming's I don't see any meaningful use of it. The death, plague and hell part cracks me up. Surely, there are many wired forums around! Any progress on this idea. It's a nice feature and Twitter/YouTube also provides the same functionality. I usually prefer a dark theme during night time but, (as an admin) turning the website dark for everyone would not be a great idea. 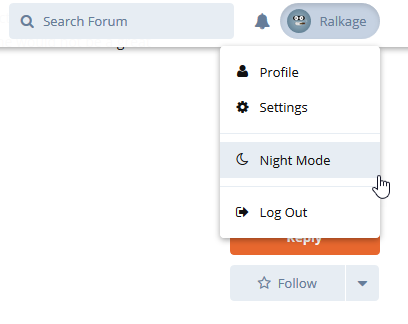 Ralkage Is it just some modified inspect element or you made it real? I'd be extremely happy if you made it real! duman Modified HTML via Developer Tools. I was just displaying what it would look like initially if it were created. Though, it's not far-fetched but is still do-able. sijad best of luck! I'm waiting for another amazing extension of yours! it's almost ready, still has few bugs, after fixing those it'll be released as an extension. dark style autogenerate via a script using diff between dark and light styles. there's a demo for stylus. sijad I'm honestly excited about this. Thank you very much! Felli first bugs of that script should get fixed, extension need more time to be done, e.g. add ability to let user choose dark mode in front-end, save that settings, regenerate css, etc. I see, its a custom theme design made for a 3rd party web browser extension.